In a closed-door meeting at the German ambassador’s residence, EU diplomats sought assurance from Narendra Modi that ‘2002’ would not be repeated under a Modi administration. Modi’s reply: “there has been no communal violence in Gujarat since 2002.” Business, Indian and Western, is solidly behind Modi. Goldman Sachs recently upgraded its outlook in a recent report titled “Modi-fying our View: raise India to Marketweight,” citing the market expectation that the Modi-led pro-reform Hindu nationalist BJP will form the next government in New Delhi. How should we update our expectations about Hindu-Muslim violence in India in the run up to the election and in the potential aftermath of a Modi victory? For the past few weeks, the Policy Tensor has been investigating the mechanics of Hindu-Muslim riots and anti-Muslim pogroms in India. It is important to distinguish between ethnic riots and pogroms. Ethnic riots are episodes of collective inter-ethnic violence that may or may not be instigated by extremist organizations, but do not enjoy the sponsorship or support of the state apparatus to any significant degree. Their occurrence is a manifestation of the failure of the state to impose its monopoly of violence. On the other hand, pogroms are ethnic riots characterized by violence primarily against ethnic minorities, with at least the tacit support of state power and state complicity. India has had plenty of both. In the past decade, remarkable progress has been in our understanding of Hindu-Muslim violence. The pivotal development was the publication of the Wilkinson-Varshney dataset on Hindu-Muslim violence in India. The dataset provides comprehensive data on all Hindu-Muslim riots reported in the major Indian newspaper of record in the period 1950-1995, including information on location (village, town, district, state), casualties, and duration. This has allowed for rigorous testing of theories of ethnic violence with a precision almost unheard of in social sciences. Attendant progress on the theoretical front has been as impressive. The debate is centered at a trinity of scholars: Steven Wilkinson at Yale, Paul R. Brass at the University of Washington, Seattle, and Ashutosh Varshney at Brown. 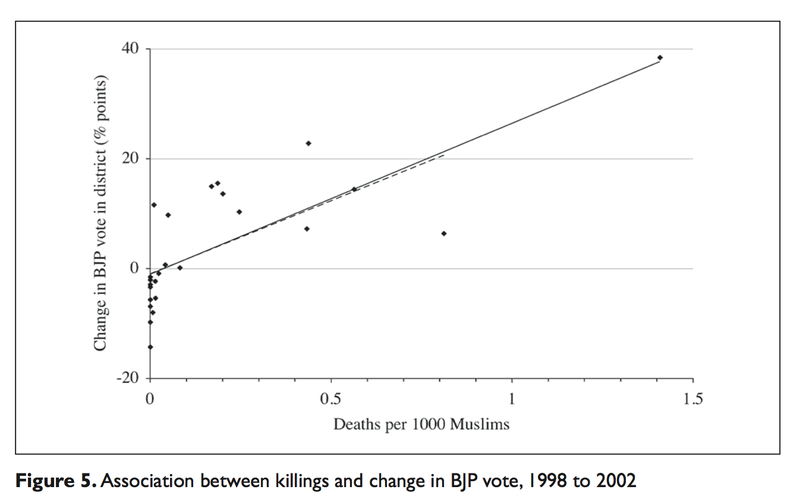 Varshney has argued that India’s Hindu-Muslim violence is city-specific (rural India accounts for a mere 3.6% of deaths due to ethnic violence), and the highly-skewed variation among cities (8 cities account for 46% deaths) can be explained by associational forms of engagement between Hindus and Muslims. That is, “organized civic networks, when inter-communal, not only do a better job of withstanding exogenous communal shocks…they also constrain local politicians in their strategic behaviour.” Varshney’s argument is “more applicable to riots than to pogroms or civil wars.” Varshney’s work explains the resistance of civil society to mobilization efforts for ethnic violence in terms of personal networks in rural settings, and associational networks urban ones. We shall not explore Varshney’s theory which is more useful to understand low-level sporadic violence but not much use in understanding endemic violence. If the reader is interested in his work, she should read his Ethnic Conflict and Civic Life: Hindus and Muslims in India. The most impressive of the three is Paul R. Brass. His work, laid out in The Production of Hindu-Muslim Violence in India, explains the persistence of riots in towns and cities. These riots are not spontaneous combustions along fault lines between mutually antagonistic communities per the hegemonic discourse of Indian newspapers and Western armchair wonks. This ‘communal discourse,’ which explains riots as a natural, unpredictable, random flare-ups of deep-seated inter-ethnic hostility, itself plays a key role in displacing the blame from the perpetrators of violence to imagined communities, and hence nobody in particular; somewhat akin to ‘calling on restraint on both sides’ as the powerful slaughter the weak. In India, all this takes place within a discourse of Hindu-Muslim hostility that denies the deliberate and purposive character of the violence by attributing it to the spontaneous reactions of ordinary Hindus and Muslims, locked in a web of mutual antagonisms said to have a long history. In the meantime, in post-Independence India, what are labelled Hindu-Muslim riots have more often than not been turned into pogroms and massacres of Muslims, in which few Hindus are killed. are best conceived as dramatic productions in which the directors are not in complete control, the cast of characters varies – some being paid, some of them acting voluntarily for loot or fun – and many of the parts have been rehearsed, but others have not. a perpetually operative network of roles whose functions are to maintain communal hostilities, recruit persons to protest against or otherwise make public or bring to the notice of the authorities incidents presumed dangerous to the peace of the city, mobilize crowds to threaten or intimidate persons from the other community, recruit criminals for violent actions when it is desired to “retaliate” against persons from the other community, and, if the political context is right, to let loose widespread violent action. moves about the city uncovering incidents ostensibly to prevent such incidents from turning into communal riots. However, the actual effects of his actions and those of others who play this role is to keep the embers from dying out. The news is transmitted instantly from the scene to persons in the RSS and the BJP who then decide whether or not it is worthy of their attention and action. If deemed so – that is, if the political context is such that “political capital” can be gained from it – then a group will be rushed to the scene. They will not necessarily rush with the intent to begin a fracas, but they will go to observe, to confront, and, if necessary, to decide whether or not further forces should be mobilized. The organizations of the Sangh Parivaar are deeply implicated in these sites of riot persistence. This family of Hindu nationalist organizations has at its core the cadre-based extremist organization founded in 1925, the RSS. The political wing is the BJP, which was ironically re-founded as a moderate centre right party in 1980. The Bajrang Dal is a militia composed of goons who are sent in to wreck havoc when the need arises. Other close affiliates of the Parivaar include the Hindu Mahasabha, the ABVP (a Hindu nationalist party active in student unions), among dozens of others listed on Wikipedia. The most effective method for elite-dominated ethnic parties to mobilize those target voters who are at risk of voting for the main rival parties will be to use ethnic wedge issues to increase—albeit in the short term—the salience of ethnic issues that will favour their party. These riot-systems are sent into their deadly motion by the political bosses when the BJP finds it politically useful and/or necessary. Until this point, there is nothing surprising to any critical observer of the Indian scene. However, Wilkinson’s model is much deeper and it is time to lay it out. Instead of summarizing his theory directly, it makes much more pedagogical sense to describe the mechanics of a pogrom. This will allow us to explore the entire framework from the ground level up. Consider a town which is a site of persistent Hindu-Muslim violence (Ahmedabad, Meerut, Aligarh, et cetera). Suppose an upper caste Hindu girl falls in love with a Muslim boy from her college and elopes with him in the expectation of possible violent repercussions from her family. The broken father seeks help from the neighbourhood political type. In upper caste neighbourhoods of riot prone towns this is invariably an RSS pracharak or BJP functionary. The Parivaar news network filters this useful information up to the ‘conversion specialist’ who needs to decide if the political context is ripe for mobilization. If escalation is politically useful, Bajrang Dal goons are sent to rough up the boy’s family and neighbours. The news filters through to the police station chief who, realizing that ‘communal tensions’ are in the offing, immediately informs the Superintendent of Police (SP, a career IPS officer) and the District Magistrate (DM, a career IAS officer). Suppose the ‘conversion specialist’ and his political bosses deem that a riot may prove useful to polarize the electorate in light of the coming municipal, state assembly, or national election. A religious procession of some sort – a classic ethnic mobilization tactic – is announced that goes through Muslim neighbourhoods, whose only goal is to provoke the minority by vocal abuse or symbolic taunts, to throw stones or do anything that may serve as a pretext for starting the riot/pogrom. At this point, when the riot system moves into high gear, the role of the state becomes paramount. In particular, it is the political will of the ruling party at the state level that is the critical variable. A district administration under strict orders from the state government to maintain the peace would forbid the procession or change the route and make security arrangements to prevent a riot. In extreme cases such as Gujarat in 2002, the district administration may be told to stand down and let the pogrom unfold. Usually, the district administration detects the lack of political will in the state government to protect minorities, or the implicit preferences of the ruling party, and acts accordingly. Note that as soon as a government is formed in a state, the new political bosses immediately reshuffle all the key district officers. The DM and the SP are chosen on the basis of loyalty and transferred out to impotent posts at the first hint of insubordination. These officers, the crème de la crème of India’s meritocracy, have to obey their political masters. Whence, the key variable is the political will of the state government. It is here that Wilkinson’s logic is deep and impeccable. It is – no surprise at all – a realist theory of politics, that posits that political parties that rely on the minority vote as a critical component of their winning coalition, are willing to supply protection in exchange for political support. Whence, in multipolar states, that is, states with three or more competitive parties, where Muslims, who usually account for around 15-20% of vote, are, or can any time become, pivotal in the electoral calculus, the supply of said protection will be forthcoming. The political bosses who depend on the Muslim vote will lean heavily on the district administration to prevent the riot, and if one breaks out, to contain it immediately. In bipolar states on the other hand, Muslims are unlikely to count in the electoral game, the BJP can hold power on its own, and hence, the political will to prevent or contain Hindu-Muslim violence may not be forthcoming. Not only does this explain the statistical spatial and temporal variation of the Wilkinson-Varshney data at a robust level of significance, it even explains some remarkable anomalies. For instance, in the greatest wave of riots that followed on the heels of Advani’s Rath Yatra to demolish the mosque in Ayodhya, the riots were forcefully quelled in Bihar and UP (both multipolar states), where the RJD and the SP were in power respectively (both electoral coalitions of lower castes and Muslims). In fact, the few deaths that took place were of Hindu riot-mongers who were shot by the police to prevent mass riots! On the other hand, in bipolar Maharashtra, around a thousand Muslims were slaughtered in, what was until 2002, the biggest anti-Muslim pogrom since the butchery of the partition. Not only does the Wilkinson model explain interstate variation, it also explains intrastate variation. 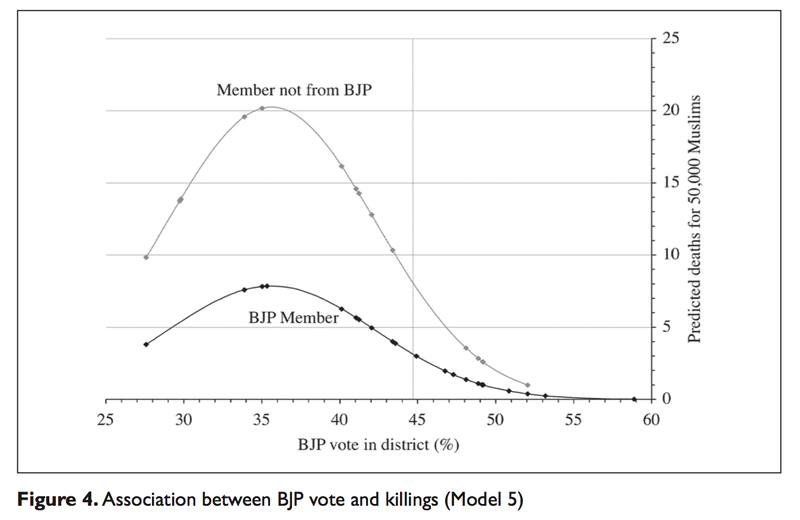 Indeed, the model predicted – with an unheard of degree of accuracy – the spatial distribution of killings in Gujarat in 2002. Dhattiwala and Biggs apply the model to the riot data. They explain the context and findings. The BJP’s grip on the state had begun to wane. The party had fared poorly in civic and district panchayat elections in 2000. After widespread criticism of its response to a massive earthquake, the BJP lost two by-elections in September 2001: one for the State Assembly, and one for the Parliament in Delhi. The Chief Minister resigned, to be replaced by Modi. Under Modi, however, the BJP lost two further Assembly seats in three by-elections in February 2002. In those four by-elections for the State Assembly, its vote fell on an average by 14 percentage points from 1998. A complete revival of the Gujarat BJP was vital, particularly for the new Chief Minister, before state elections scheduled for the end of 2002. Our findings provide further evidence for the BJP’s crucial role in orchestrating the violence. This is not surprising, given the weight of qualitative evidence, and the arguments of scholars like Brass and Wilkinson. 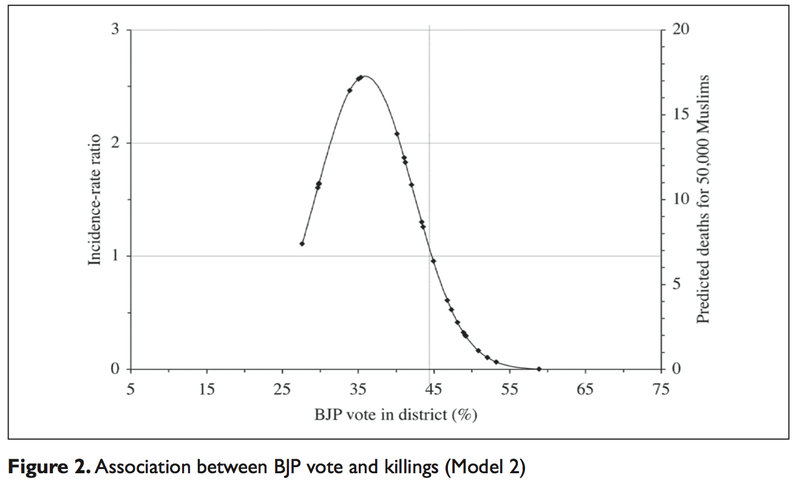 What is less obvious, however, is that violence was actually lowest in constituencies or districts where the BJP had won a majority of voters in 1998. By implication, the party had the power to prevent as well as inflame violence. Violence was highest in constituencies or districts where the BJP could expect to face the most intense competition in the forthcoming election. The party apparently anticipated benefitting from the violence, because in July the Chief Minister resigned and dissolved the State Assembly in an attempt to precipitate an early election—nine months before elections were scheduled. What does this all mean for the next election? For the possibilities of a Modi victory? For India after Modi? For that discussion, we will need to take Perry Anderson by the horns. Stay tuned.